Staring at a blank page is the hardest part about starting a website project, and for those who aren’t blessed with amazing design skills, all the time in the world just isn’t going to make you a great designer. But that’s ok. You can use the the UABB addon for Beaver Builder to completely remove the design phase of your website process and still end up with your website looking amazing. We just did this on a recent client project and needed to write this post because we’re just so excited to use it on our next project! Understand the project requirements: We revise their design brief and analyze three competitor websites that they’ve listed on their brief. Design the home page until the client approves: We design the homepage and then go through an iterative process with the client until they are happy and approve the design in Trello, our project management software (NOTE: Please comment below if you’d like a post on how we’re using Trello here to manage our projects). Design the content pages of the website: We carry over the header and footer and then work with the client to finalize the mockups of the content pages. We usually put a limit on the number of revisions a client can do per page. Develop the website: Based on the approved designs, we begin to code the website. Handover: Provide login details for the client to access if they need to edit their own content. A couple of weeks ago we purchased the Lifetime License of UABB and this week we decided to try and approach our next custom job differently. This current project is what sparked this blog post and we hope it offers you some insight into how you might also be able to do things quicker and pretty much never need to learn how to design a website from scratch. We’ve been following the Beaver Builder community for a while now and one of the main reservations we had with Beaver Builder is in regards to the influx of third-party Beaver Builder addons that were seemingly released overnight. Until this week, we’ve never installed a third-party Beaver Builder plugin, ever! WHY? Because our agency is automated! Backups happen on a schedule, WordPress core and themes and plugins are automatically updated, as is billing. It’s all done, automatically. Automation is great and allows us to work on our company, rather than in. But there’s a catch with automation. Limit the number of plugins on our sites and only use products we trust. Only use plugins that will stick around for a long time (can you imagine if you used a plugin on 50 websites and then the plugin was discontinued? What a headache!). Look at the history of the person who is releasing the addon. Have they been around for a while in the online space? Do they have any accreditations? Think whether you really need the addon. If you have never had the needfor what the plugin is offering, maybe you’re just getting excited? If it will save you time, then maybe it might be worth buying. We needed to save time designing and the modules and sections in UABB met this need. Review the changelog and support forums for the plugin. If the changelog has not been updated frequently and the support questions aren’t getting answered, this is a sure sign you do not want that product on your websites. After considering all these factors, we purchased UABB for Beaver Builder, making it our first ever third party Beaver Builder addon. We did this for the reasons we’ll mention in a minute, but long story short – it’s incredibly powerful and helped us cut out the design phase pretty much completely. Purchase UABB if you haven’t already, with the lifetime option our recommendation, or learn more as to why we thing you’re missing out if you don’t give this product a try. 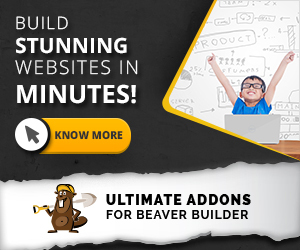 The most powerful third-party Beaver Builder addon currently available. UABB is the Beaver Builder addon that holds the most value in the Beaver Builder third-party marketplace currently. It’s not only built by a team who have already proven themselves in a similar marketplace, but also it’s launch has already gained a following of over 500 active customers in a very short timeframe and their changelog is rapidly growing with new features. UABB introduces a new feature called Sections and you can check them out by clicking here. They’re crazy useful and we can’t wait to use them on our next client project. This will be the first time for BeyondBeaver.com that we’ll be using a third party Beaver Builder addon for a client project. We’re very picky, but the sections are incredibly time-saving and it would be stupid not to take advantage of them (we have bought the lifetime license of UABB so now is as good as any time to start taking advantage of that). Jump into your favourite design program like Adobe Photoshop (or Adobe InDesign, our favourite software for designing websites) and begin to work the homepage design out. Design live in Beaver builder by dragging and dropping modules, columns and rows into the page. UABB’s sections have been professionally designed so you can think less and do more of what matters. For us here at BeyondBeaver.com, we’re extremely results-driven when it comes to our client projects – the main thing we strive for with a client project is for the client to make profit and succeed online. The basic formula we follow is to help our clients increase brand awareness to drive more traffic to their products and services, and from here work to grow their conversions and subsequently increase their profits. Doing this takes time and mental awareness on our behalf, but also eats the the client’s budget. Web design has been around for so long now and most of the time you spend designing is really just time appropriating an already existing design that’s been done years before. So, why spend budget and mental energy redoing something? STEP 1: Understand what content is needed on the page to maximize conversions. Consider your client’s brief and also analyze competitor websites to get an understanding of what types of information are needed on each page to maximize your client’s conversions. You might decide that for this client’s industry, on the homepage they need a testimonial, a how-to video, a list of their top 3 products and a newsletter subscribe form. STEP 2: Build the page straight in Beaver builder using UABB’s sections. You know what content is needed on the homepage from the analysis you took in point 1, so go through the sections UABB has to offer and drag in a section that contains the content you’re needing. Need testimonials? Drag in a section you like from the Testimonials type of content. Repeat this for each type of content you need (team members, FAQs etc). STEP 3: Send the design to your client. Done, easy. By the end of this process, you’ll have a great looking website which didn’t drain you mentally, was quick to turn around so you maximized your time vs profit ratio, and you’ve also built a website focused around conversion WITHOUT getting stuck in the small design details that don’t matter. Visit the UABB website to sample all the different Page Builder modules. On the right in the dark grey you can see about 50% of the available modules – there’s heaps! As well as the sections, you can leverage the pre-made modules that come with UABB. We’re not too fussed on fancy things in our designs that move all over the place as they’re distracting (you wont find any sliders or slideshow on our websites) but one of our favourite custom modules in UABB is the row separators capability. Add these effects to the rows you build and it instantly adds that much needed creative flare to your designs. We used row separators this week for the client Project we have used UABB on first time. You can see them below – they work well! BrainstormForce is their name and they’re the same folks behind the popular plugin Ultimate Addons for Visual Composer that has over 28,000 sales and has maintained a consistent 5 star rating based on customer reviews. They’ve also developed ConvertPlug, a lead-capture plugin which competes with Thrive Leads and OptinMonster. ConvertPlug has 2,164 sales and also has a 5 star rating. They aren’t going to leave you with an unsupported, out-of-date plugin: They have maintained and actively developed over 28,000 customers for Ultimate Addons for Visual Composer and have done so consistently for 2.5 years and counting. Our client websites here at BeyondBeaver.com team are part of an automated system which we know works, where websites are updated and backups are taken securely to cloud storage on a regular basis. For the automatic update procedure to go as planned without hiccups, we need to be careful of the things we install, otherwise a website may break during the auto update. We’re confident this plugin will not cause any major issues on our client websites. They have big plans: I reached out to the developers before writing this article to see if they had any ideas where they’d be taking the addon in the future. From what they could disclose, we at BeyondBeaver.com are very happy that we’ve bought the Lifetime license of UABB, as they’ll be adding in many more features in the near future and we won’t ever have to pay a cent more for them. We own this plugin and any future updates for life! When is amazing when you’re a business doing client work trying to generate a profit. It’s all profit now with this baby. They’re support is great: Jump on over to the Ultimate Addons for Beaver Builde Facebook group where they post many times a day and actively support their clients. We’d love to know if you purchase (or have purchased) UABB and how much time it is saving you. We’d also love to hear about how much it has changed your web design workflow. Have you completely cut out the design phase like us? Thanks for sharing your design process, Grant! And yes, of course I would love to see how you use Trello to manage your projects. I am looking forward to learn a lot again! Great post. Already bought UABB and find it to be a great tool. Yes, please do a poist on how you use Trello. Very interested!